Valentines Day Gift Ideas For Her. One / Two / Three / Four / Five / Six / seven. Myself and my boyfriend rob celebrate Valentines Day but with small gifts or days out. This year we have decided to celebrate our six year anniversary and Valentines Day together. Our plan is to get something small but make a day off something, walking our dogs, making a lovely tea or going out for the day to the zoo. I have decided to share with you some small ideas for gifts, little tokens to say i love you. I am obsessed with the Build a bear Toothless, this is something I have pointed out to Rob for my gift. He is adorable and it is something we love watching together. I have included some key rings, i am on the look out for some cute ones for my new house keys, the heart emoji is something I would love. We all use emoji s so this would be a great little gift for someone this Valentines Day. Topshop always have such great clothes in, I wish my bank balance would allow me to shop there but as I am an adult I have so many house bills to pay. I love this cute stripe top with a small black heart on it, this would be nice to wear with jeans. Over on Asos I fell in love with so many cute things, I love these little tins. They would make a great gift for someone who loves to store things like make up, rings or even food to take to work. Hannah Maggs make up bags would be a great gift, they are special and look amazing. I love all the prints and this would be great to get as a gift, we all love having a cute make up bag to store our make up in. She is one of my all time favourite bloggers/ Youtubers too so supporting her would be amazing. What would you like this Valentines Day? 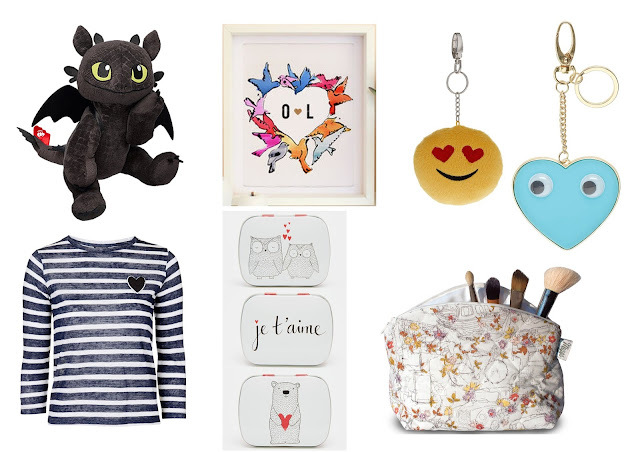 Fab wishlist lovely, I really love the emoji keyring especially the heart one! I can't believe how quick time is passing!